The Badshahi Mosque (Urdu: بادشاھی مسجد), (from Persian, Padshahi, "imperial") or the 'Emperor's Mosque', in Lahore is the second largest mosque in Pakistan and South Asia and the fifth largest mosque in the world. Epitomising the beauty, passion and grandeur of the Mughal era, it is Lahore's most famous landmark and a major tourist attraction. Capable of accommodating 10,000 worshippers in its main prayer hall and a further 100,000 in its courtyard and porticoes, it remained the largest mosque in the world from 1673 to 1986 (a period of 313 years), when overtaken in size by the completion of the Faisal Mosque in Islamabad. Today, it remains the second largest mosque in Pakistan and South Asia and the fifth largest mosque in the world after the Masjid al-Haram (Grand Mosque) of Mecca, the Al-Masjid al-Nabawi (Prophet's Mosque) in Medina, the Hassan II Mosque in Casablanca and the Faisal Mosque in Islamabad. The mosque was built under the patronage of the sixth Mughal Emperor, Aurangzeb Alamgir. It was completed in 1673 under the supervision of Aurangzeb's foster brother Muzaffar Hussain (also known as Fidaie Khan Koka) who was appointed governor of Lahore in May 1671 and held this post until 1675. He was also Master of Ordnance to the emperor. 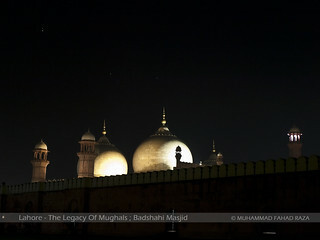 Like the character of its founder, the mosque is bold, vast and majestic in its expression. The interior has rich embellishment in stucco tracery (Manbatkari) and panelling with a fresco touch, all in bold relief, as well as marble inlay. The exterior is decorated with stone carving as well as marble inlay on red sandstone, specially of Loti form motifs in bold relief. The embellishment has Indo-Greek, Central Asian and Indian architectural influence both in technique and motifs. The skyline is furnished by beautiful ornamental merlons inlaid with marble lining adding grace to the perimeter of the mosque. In its various architectural features like the vast square courtyard, the side aisles (dalans), the four corner minars, the projecting central transept of the prayer chamber and the grand entrance gate, is summed up history of the development of mosque architecture of the Muslim world over the thousand years prior to its construction in 1673. About This Image: This was shot at around 3:00 am on my late night tour of the walled city of Lahore. Due to the energy crisis, I couldn't find much lights in the otherwise well-lit city of Lahore, therefore I resorted myself to Badshahi Masjid (which however, wasn't too well lit either - an unusual thing to happen). The idea was to take an aerial view of the grand architecture, but being very late, we were denied access to many rooftops in the surrounding area. This was taken on the back end (facing Lady Willington Hospital) with the camera mounted on my Gorila Pod! Even though I wanted to do lots of stuff with this image, and I tried . . . . but nothing looked better than the original - hence this is SOOC with just the watermark added! Click Here To View The History of Badshahi Masjid by an old Man. MUST WATCH! You're Missing Out If You Don't View Large!